A Calgary investment firm is launching one of Canada’s first cannabis real estate investment trusts. 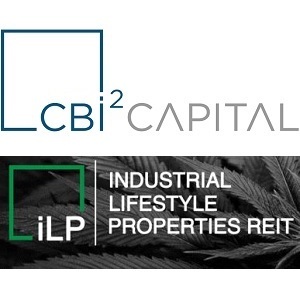 CBi2 Capital announced this week investment in Industrial Lifestyle Properties Real Estate Investment Trust (iLP) which will acquire, develop and manage cultivation facilities, industrial properties and real estate for the cannabis industry. The REIT can provide investors an opportunity to enter the developing industry with less risk than a direct investment in a cannabis producer. By providing sales-leaseback transactions, it will also allow cannabis producers to unlock capital for higher return activities, according to CBi2. REIT to operate in Canada and U.S. The REIT will operate in both Canada and the U.S., says Mottahed. “I would say in the context of the Canadian market there are over 90 licensed (cannabis) producers, so 90 potential counterparties for a business like this. And there are probably an additional 100 cannabis-type facilities that, over the course of the next one to three years, will end up being developed . . . so call it up to 200 potential counterparties,” says Mottahed. While initial investments may well be in Canada, Mottahed says the U.S. will be a focus for the REIT. Because cannabis is not federally legal south of the border, companies don’t have easy access to markets to raise capital and the REIT’s ability to unlock cash should be attractive. iLP will have its own management team and board of directors. David McGorman, currently a managing director with Calgary’s Black Spruce Merchant Capital, will be the managing partner for iLP. Mottahed says McGorman has advised a number of cannabis companies and the REIT’s board of trustees will have significant background and experience in the sector. CBi2 will initially invest $1 million in the REIT. “The idea was to give iLP enough capital to go out and do one to five to 10 deposits on facilities and then to take those LOIs (letters of intent) and do a larger raise surrounding it,” says Mottahed. The REIT is eventually expected to become publicly listed, but Mottahed said the timing has still to be determined. “It needs to be little further baked. Pardon the pun,” he says. The timing decision will be made in consultation with whichever investment banks iLP works with to do the larger raise, says Mottahed. CBi2 Capital (the firm is currently named Target Capital Inc. but will be renamed on shareholder approval), is developing a cannabis-focused investment strategy..
“The reality is the cannabis industry is a real business,” says Mottahed. “In the context of the Canadian marketplace, it’s going to be a legal business. . . . We know there’s a well-established black market demand. The big question is how big will this business be upon legalization? Barry Schwartz, vice-president and chief investment officer for Baskin Wealth Management, says the markets are very excited about the cannabis sector, which could be worth $5 billion-plus once the commodity becomes legal. There is a growing number of players wanting to get into associated parts of the industry. “We’ve been seeing a huge demand for industrial warehouse space as a result of the continued boom in e-commerce and the potential of what’s happening with marijuana,” Schwarz says. He says the producing companies have high-priced, but no-value stocks and need to build inventory. They do need cash. The REIT “sounds like an extremely reasonable idea,” he says. Schwartz says it’s still early days for the sector as a whole. “There’s going to be more interest and more capital flow into it, but there’s a huge amount of risks. A lot of the cannabis producers are trading at valuations that don’t make any sense.